A warm welcome to my long-standing friend, Roland Clarke. We have much in common, and if you share a love of horses with us, you’re in for a treat! 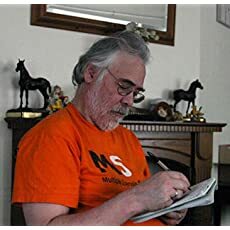 You can read my review of Roland’s Spiral of Hooves on the Amazon UK link below. I must begin by thanking Jane for having me on her blog – or maybe I invited myself like an imposing friend. Setting plays a key role in not only my writing as I met Jane wearing a different hat. Back in 2005, I was co-organiser of Borde Hill Horse Trials held at my family home which I’ve always felt was the right setting for horse events. Jane was part of our amazing team as one of the experienced dressage judges. Most eventing shows that I ever attended as a professional equestrian journalist and photographer were in glorious locations – the pinnacle being Badminton. Nobody was surprised then when my debut novel, Spiral of Hooves used many of these locations, including Borde Hill and Badminton, for its mystery set against the eventing world I knew. There is a draft sequel written, set in France and the USA, that adds endurance events to the line-up – and Idaho where I now live is central. However, my writing focus is back where my wife and I lived last – Snowdonia. My mind and heart are there now. There will be some horses, although outnumbered by the sheep that are everywhere in North Wales. Snowdon Shadows is a police procedural series that roams over much of the picturesque scenery that draws so many tourists to North Wales, from the mountains of Snowdonia to the beaches along the Llyn Peninsula. What would have been Book 1, Fates Maelstrom was originally set on Dartmoor – until my wife and I moved to Harlech with its castle, and a view from our house of Snowdon. It didn’t take me long to create Craig-y-Niwl, a fictional village in the heart of Snowdonia, inspired by the villages we encountered as we explored the area. Sadly, due to health and other factors, we left Wales in 2016 so my wife’s family in Boise, Idaho could help us. But that Snowdon view is above my desk and my characters need me back in Wales. Their interaction with settings beyond Craig-y-Niwl add texture and, sometimes, motivation. I have scenes on beaches, in castle ruins, pubs and restaurants that demand realistic details. Some places I remember, but I always do additional research online using a variety of searches like Google Maps which I find opens other sources. For instance, for a short story that will be part of Fevered – the new Book 1- I used some standing stones at Porthmadog that we used to drive past. Using Google Maps, I could revisit the scene with views from the road and within the circle. Sometimes, Google Maps will give landmarks with website links, although more often it’s more a case of doing a search on a place name. Yes, I admit that Wikipedia is often a starting point, but it can be a gateway. Photos have proved invaluable and allow me to visit parts of North Wales that I missed, and ideas occur that I can apply to my settings. Confession: I never reached the top of Snowdon even though it is wheelchair accessible. When it comes to finding the right words to create a sense of setting, I strive to sketch enough details to create pictures in a reader’s head, and if the reader knows the place then I aim to evoke their memories. Whether that works remains to be seen when the first book emerges from Snowdon’s shadow. Oh. I used the word ‘diverse’ for two reasons. First, the locations themselves are varied. Second, my series tackles ‘diversity’ issues. Is it wrong to make my MC a queer detective? It doesn’t change how she reacts to her surroundings – to that glorious Snowdonia vista. This entry was posted in Authors and tagged Badminton, Borde Hill Horse Trials, sheep, Snowdonia, Spiral of Hooves. Bookmark the permalink. Many thanks, Jane for the chance to delve into settings. My equestrian friend and fellow writer, Jane Bwye gave me the opportunity to write about the ‘Diverse Settings’ in my books, from Spiral of Hooves to the Snowdon Shadows that I’m engrossed in creating.